OddJobs? Handyman Services provides an affordable property improvement and repair service. Specialising in taking care of the little things, OddJobs? Handyman Services is the one to turn to when the bigger operators turn your job down. The business began with a chance encounter at a local supermarket – recent storms had destroyed a wooden fence; could I fix it and how much did I think it would cost? During this repair, an approach was made from the other side of the fence; could I renew a different fence and remove some fill and vegetation from site and how much would it cost? This influenced a decision to “test the water’, publicise a local minor home-improvement and repair service with mailbox flyers and supermarket notices. OddJobs? Handyman Services has continued to grow since then and today enjoys the support of many repeat and one-off customers. Curious? Check the ‘Testimonials’ page. Try OddJobs? 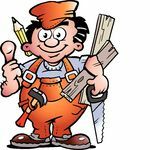 Handyman Services for yourself!